Each can contains 5 pounds of Strawberry Banana Gelatin Mix. That's 103 servings of Strawberry Banana Gelatin! Kids and adults alike can't help but smile at this jiggly treat. 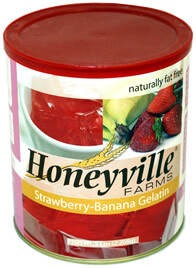 Honeyville's Strawberry Banana Gelatin is a jumbo-sized adaptation of the small, store-bought, boxes of gelatin. Each large #10 can contains 103 servings of Strawberry Banana Gelatin. That's about 26 average size boxes of store bought gelatin. It's a great value that will go a long way. Try some today! Basic Instructions: Add 2 cups of boiling water to 1 cup of gelatin mix and stir until completely dissolved. Add 2 cups of cold water to mix, stir well. Pour into a small glass pan and refrigerate for 4 hours. Ingredients: Sugar, Gelatin, Fumaric Acid, Sodium Citrate, Citric Acid, Salt, Potassium Sorbate, Artificial Flavor, FD&C Red 40.